Are you a resident of the City of Charlotte? Do you need some trees for your yard? TreesCharlotte is hosting a free TreeStore. Proof of Charlotte residency as well as a valid email address must be provided in order to participate. 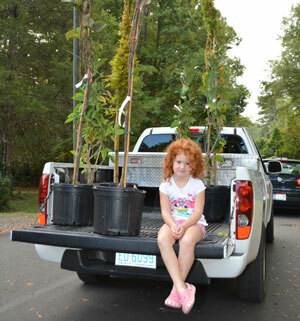 At the TreeStore, you will be trained on how to properly plant and care for your tree(s). Tree training is mandatory. You will then be asked to complete and sign a Stewardship Pledge Form with your home and email address (mandatory) and declare your pledge to take care of the tree(s) we provide. We cannot guarantee species type or quantities. Trees are 6-10′ tall, and will not be reserved or transported. Below is a list of potential trees that may be offered during the TreeStore. These specific species are not guaranteed as we are dependent on what our growers have in stock at the time of delivery. Thank you to all our volunteers and TreeMasters that have registered to help out at this event. We have plenty of help for this event. Please visit our events calendar to volunteer at another TreesCharlotte event.